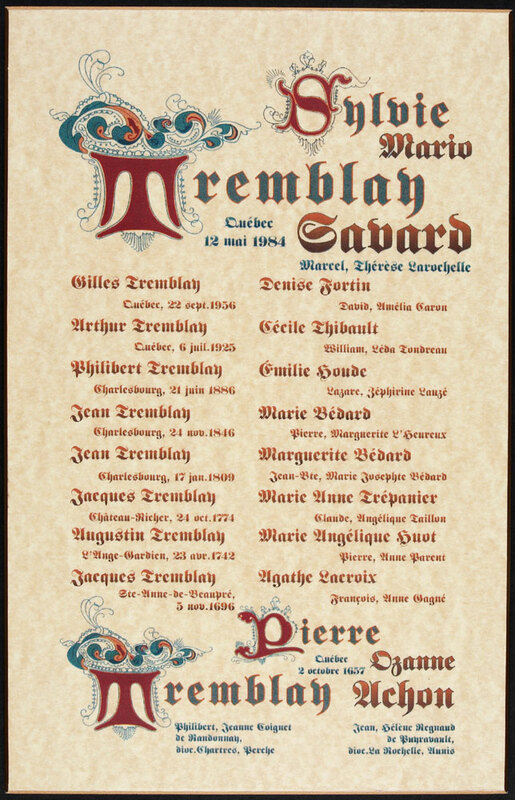 Direct line ancestry of Sylvie Tremblay. For many people, researching Family History means tracing members of a family, showing the relationships among them, recording their family stories, collecting their treasured photos and documents, and sharing all that with other family members. Genealogy, on the other hand, is often considered to be a more structured activity that incorporates standard ways of recording information, rigorous methods for assessing evidence, an academic component providing formal learning, and professional accreditation. Genealogists attend conferences; publish books and articles; design and maintain family history websites. Some also contribute to other disciplines such as medicine, genetics and history. Specialized terms are used in family history and genealogy. Consult the glossary to find out what they mean. Begin your research with yourself and work backwards. Doing this helps to avoid the possibility of documenting people who are not your ancestors. Many folks work on whatever branch of their family they find easiest and, when they hit a brick wall, they switch to another branch. Some people focus on the paternal (father's) side of a family which is often easier because the last name usually does not vary when traced back in time. The maternal (mother's) side of a family is more difficult because the maiden names of women who took their husband's surnames are not often known. Some researchers decide to follow a family surname and its variants in a One-Name Study. Others may concentrate on a particular ethnicity that occurs in their family. If you document blood relatives plus spouses, extend your research one step further to find the names of the parents and siblings of the spouse. This information can be useful when collaborating with other researchers to establish links between families. "honorary" family membership (such as "Aunt Jessie" who was a close family friend). Most important: choose a strategy that suits your interest and brings satisfaction. Tracing ancestors and descendants is the most popular research method. Researching ancestors means you work back in time from a given person. Researching descendants means you work forward in time from a given person. You will soon discover that working backward and working forward are both needed. The direct-line ancestry that draws a connection between the person and his or her ancestors with the same family name. 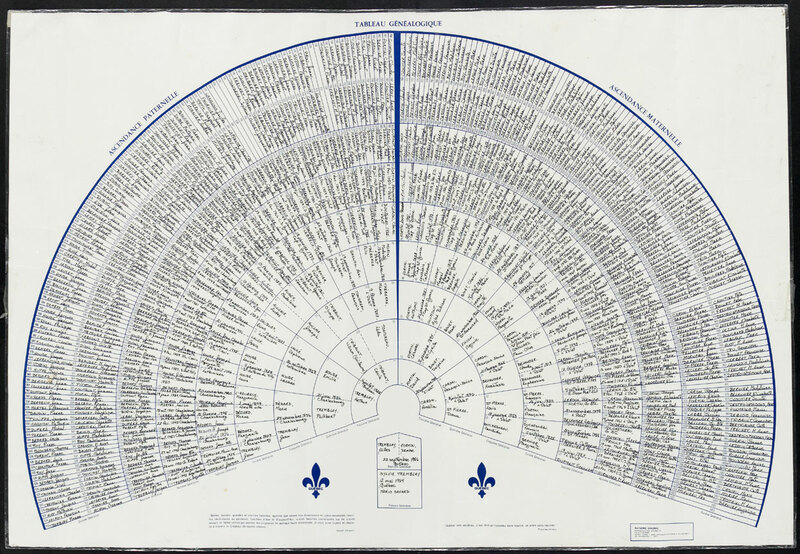 The pedigree chart that traces all the male and female ancestors, resulting in a multitude of direct lines. For reasons of efficiency, genealogists use the Stradonitz Method that attaches a different sequential number to each ancestor. 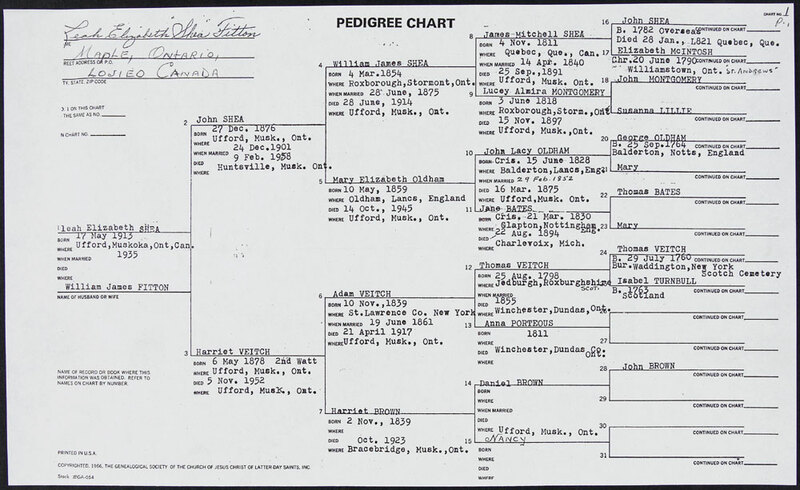 Pedigree chart of Leah Elisabeth Shea. Veitch family fonds, MG 25 G402. Unless you are documenting only direct-line ancestors (your father and mother, and all earlier fathers and mothers), you will also record aunts and uncles and cousins, and their marriages and children. Do not neglect to go "sideways" if you get stuck. Researching more about a spouse or sibling of an ancestor provides clues to more information about that ancestor. A One-Name Study is a formal investigation and documentation of all occurrences of one surname and its variants, whenever and wherever those occurred. The beginning genealogist generally does not set out to do a one-name study. If, however, you have a rare name you are attempting to document fully, or if you have worked at genealogy for a while and wish to enlarge your field of research, then a one-name study may be for you. A complete explanation of this type of genealogical research is found on the website Guild of One-Name Studies. Read more about what is involved and look at a few documented one-name studies before choosing this type of research. Even if you are not doing a one-name study, you could exchange information with researchers who are working on one-name studies. The principles are the same; only the focus differs. Canada's experience with diversity distinguishes it from most other countries. Its 30 million inhabitants reflect a cultural, ethnic and linguistic makeup found nowhere else on earth. We all belong to an ethnic group. As you begin to research your family, you will find that the most common resources in North America are for people having an English-speaking or a French-speaking ancestral origin. But if you belong to neither of these groups, you should check Ethnic Groups to learn about resources that will help you. Join a genealogical society that is specific to your ethnic group or place of origin. Their members will help you find the best approach for your research. Their activities, programs, resources and library materials will all be of value to you as you learn more about the backgrounds of your ancestors. If there is not a society in your area, you might find one in another province or even another country that offers services to members from a distance. Find a society in Links and related research. 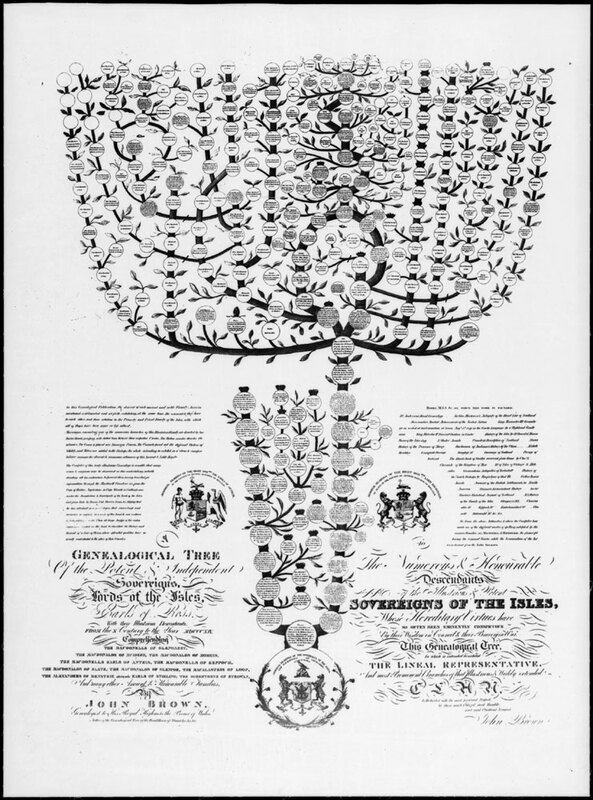 Regardless of your ethnic origin, the basics of genealogical research still apply! 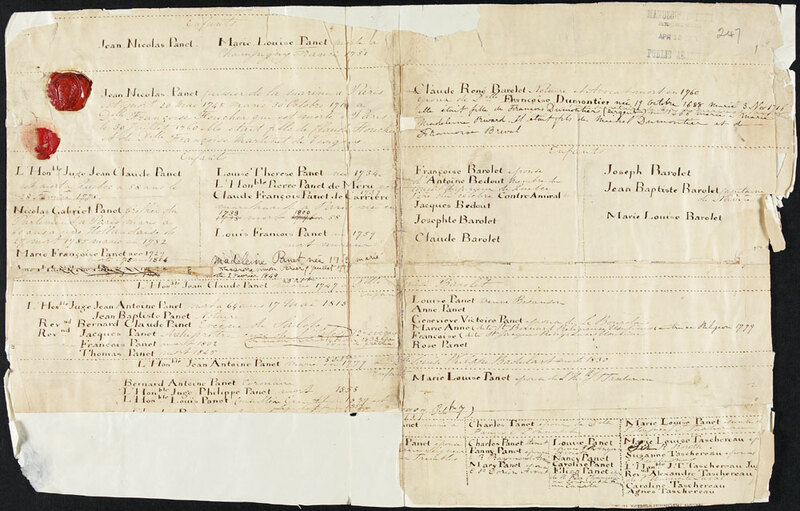 Genealogical chart of the Panet family. Library and Archives Canada, Collection à propos des familles Panet et Barolet, MG 25 G96. Macdonell family chart. Library and Archives Canada, Macdonell family genealogy, MG 25 G75.